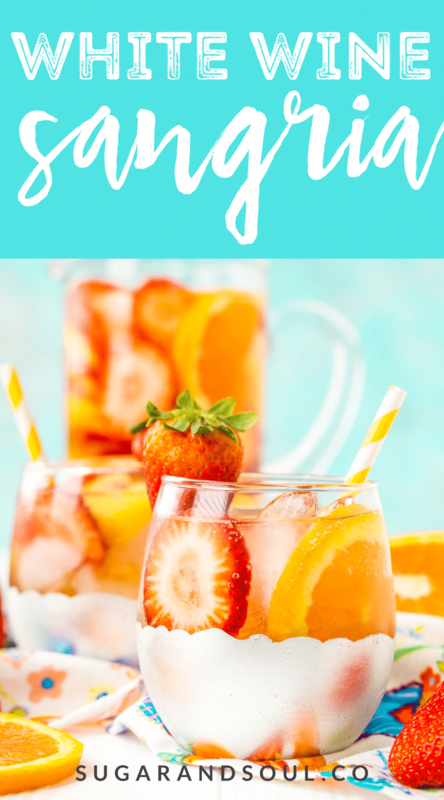 This White Wine Sangria recipe is made with juicy strawberries, oranges, and peaches as well as sweet simple syrup, apricot brandy, and a splash of club soda or seltzer! It’s an easy and refreshing summer wine cocktail. Light, refreshing, and great for a crowd, there’s nothing like a fruit-filled glass of White Wine Sangria on a balmy summer evening! 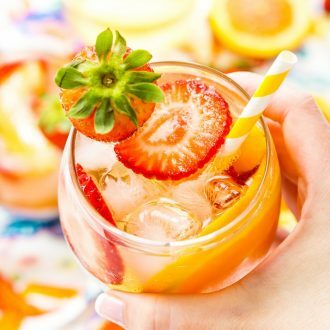 If you love both wine and cocktails, you’ll get the best of both worlds with this tasty White Wine Sangria recipe! 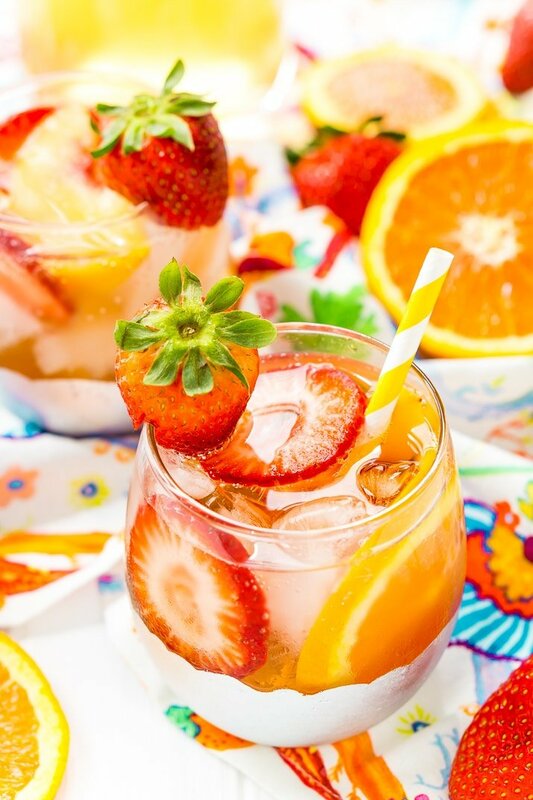 Made with white wine (of course), a splash of brandy, club soda, simple syrup, and lots of fresh fruit, this boozy beverage is a crowd-pleaser at cookouts, parties, and showers! Well, honestly, this truly varies based on who’s making the recipe and what kind of sangria they feel like making. Generally, it includes wine and fruit. Commonly, you’ll also find brandy, soda, sweetener, juice, and even the occasional hard liquor. What Type of Brandy Do You Use In Sangria? This depends on the flavor profile you’re going for. My go-to brandy flavors are apricot and blackberry, but you could use a ginger, apple, cherry, whatever you’re feeling like that’s compatible with the rest of your ingredients. It’s one of the easiest cocktails you can make because it makes a huge batch and you pretty much just have to cut up your fruits and throw all the ingredients together in a pitcher and chill for a few hours. Sangria only gets better with time, so if you let it chill overnight, you’re going to have some killer flavors on your hands! ust make sure you don’t add the ice or carbonated components until just before you’re ready to serve! Why I love this recipe! Sangria is a wonderful way to enjoy summer flavors since it’s infused with juicy, seasonal fruit. 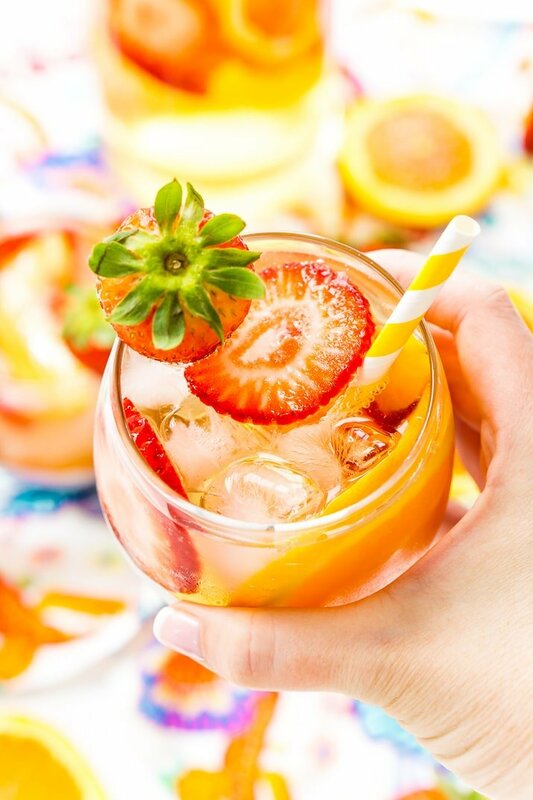 Sweet strawberries, zesty oranges, and ripe peaches make this beverage extra fragrant and fresh, while club soda adds a touch of bubbly fizz. One of the best things about this recipe is that it’s made for sharing. 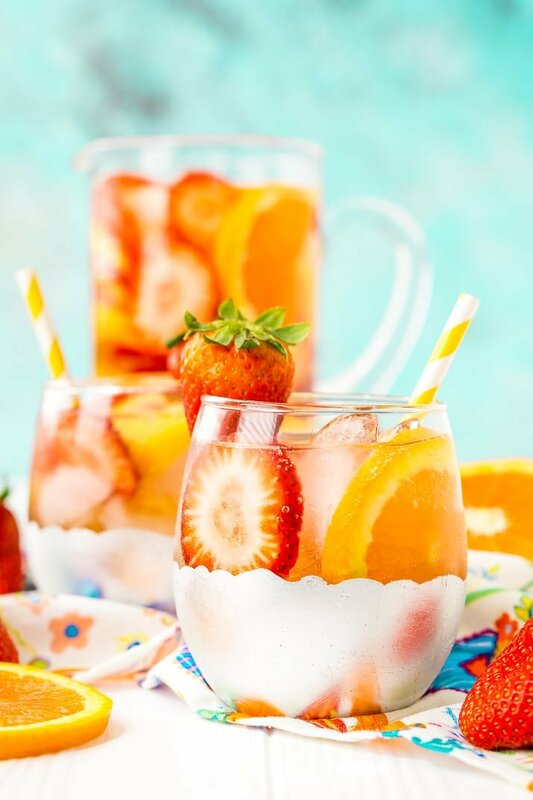 Make this sweet Sangria by the pitcherful, then serve in pretty glasses with fruit garnishes when you’re hosting summertime get-togethers. These warm months are some of the busiest for celebrating baby showers, wedding showers, graduations, reunions, and more. Why not stir up some refreshing White Wine Sangria as your signature cocktail? What’s more, you can swap out the fruit in this recipe and use whatever fruit you have in your kitchen, or — let’s face it — whatever’s on sale at the grocery store! Apple slices, blueberries, raspberries, pineapple chunks, and lemon and lime wedges are all delicious in this sparkling drink! In fact, I’m planning on mixing up a batch of White Wine Sangria for our annual Fourth of July barbecue, complete with handfuls of tangy blueberries and red strawberries to be extra patriotic! This Sangria is a fruity, refreshing drink that’ll please the palettes of both wine and cocktail lovers. Made for sharing, you can stir up a pitcherful and enjoy a few glasses with all your family and friends! Pin this Sangria Recipe for Later! 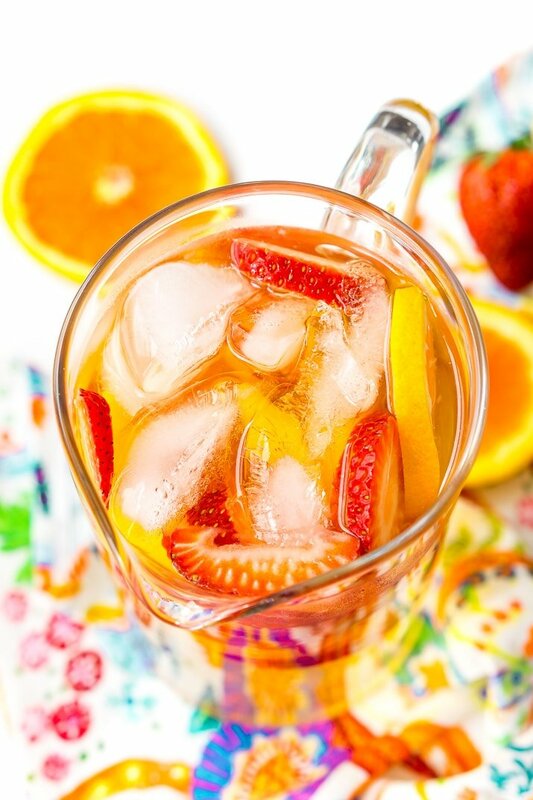 This White Wine Sangria is made with juicy strawberries, oranges, and peaches as well as sweet simple syrup, brandy, and a splash of club soda! An easy and refreshing summer wine cocktail. Add the sliced fruit to a large pitcher and pour in the wine, brandy, and simple syrup. Stir to combine and place in the fridge to chill for at least 6 hours. For serving, fill glasses halfway with ice and pour in sangria leaving room for 2 to 4 ounces of club soda. Garnish with additional fruit slices if desired. You can use a flavored seltzer if desired, citrus-based seltzers are a great choice, my family really loves the Polar brand Cranberry Clementine flavor. It's important to mix in the club soda or seltzer just before serving to ensure that it doesn't become flat. Do not add the ice until ready to serve or it will water the sangria down. If you don't have simple syrup on hand and don't have time to make any, I recommend using 2 tablespoons of powdered sugar in its place. I could so go for one of these sangrias right now! I love the idea of using white wine in it! What a beautiful looking sangria! I don’t know if I could let it sit in the fridge overnight. There will be plenty of opportunities this summer for us to enjoy this sangria. I know it’s hard, but it’s sooooo worth it!